Launceston coach Cliff Rainford said his side's 32-5 win over Bournemouth showed they are capable of becoming a team no-one will relish facing. 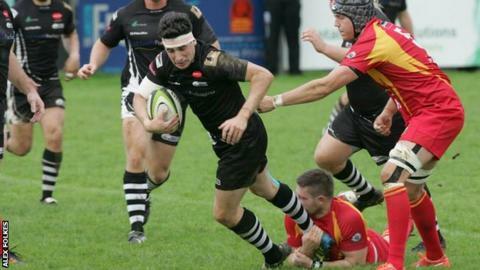 The convincing victory lifted the Cornish All Blacks up to 10th place in National League Two South. "We set ourselves the target of getting five points and we've done that and done it in some style. "If we can put the results together and we'll be a team to be reckoned with," Rainford told BBC Radio Cornwall. "It was a really massive effort from everyone and we can take really big positives from the game." "What we've got to do is convert this into away form now, we've built ourselves a fortress here and we need to keep adding bricks to it." Launceston put Bournemouth under consistent pressure and assistant coach and flanker Tom Rawlings said it had taken its toll. "They went from quite an organised Bournemouth team to one that looked like they had no structure after having their ball taken at the line-out, their scrum turned over and in open play," he continued. "We done the job on them - that last 20 minutes is hard against a side which is tapping and going from all over the place. We dug deep and got the result we wanted, it's really pleasing. "We put in a good shift and stayed unbeaten at home and we're very proud of that. We've got to keep this run going and keep performing."